How often should you clean your boat? As glamorous as it may seem to have your own boat and get out on the water every once in a while leaving daily stress behind, this is also true that boats aren’t all fun and games: taking care of your boat requires more than just a good wash. But how often will you need to work on your boat to keep it clean, fresh, and well maintained? Read on if you want to know. By waxing our boat we are not only just keeping it clean, but also protecting the graphics, sealing out scum and mildew, and keeping the hull fresh. But how often should you do that? It will depend on a few variables. For example, if you use your boats rarely and just for recreational purpose, waxing it once in a year should be enough. If you keep your boat in the water year-round, though, you may want to think about waxing your boat every three or four months, amounting to about three times per year. You should also count sun exposure as another variable. 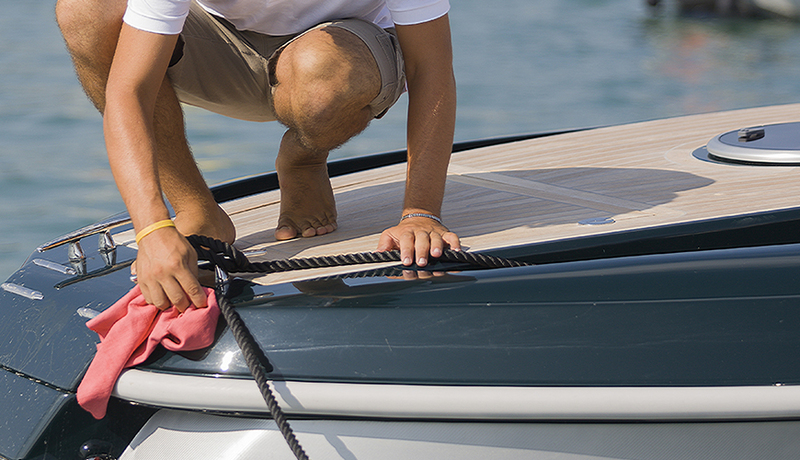 To protect your boat from UV rays, having it freshly waxed is necessary. Most people recommend washing your boat as often as you can, especially if the boat is held in water. You might be reluctant to do so, but you’ll surely see the difference if you do. While your boat is in the water helping you take your mind off regular din and bustle, salt and scum is coming in contact with the hull. And let me tell you, it has the potential to cause harm to it. So if you are keeping your boat in the water, make sure you have it lifted out every so often so that you can wash it down with environmental-friendly washing material and fresh, clean water. This will help reduce the damage caused salt water elements. How frequently you clean and maintain each part of your boat will depend on its usage. The more you boat, the more maintenance it needs, simple. If you are a frequent user, get ready to go through quite a bit of cleaning material, while others can get away with cleaning only so often. When it comes to materials like carpet and upholstery, try to “clean as you go”. Boat maintenance may now seem to be a lot of work, but if you maintain a schedule and take care of it properly, it will surely prove its worth to you. For any other queries, call Truck Washing Experts, and our team will be happy to assist you. https://www.truckwashingexperts.com.au/wp-content/uploads/2017/10/10.jpg 500 870 TrUck_w@$h https://truckwashingexperts.com.au/wp-content/uploads/2016/06/logo.png TrUck_w@$h2017-12-15 00:00:402017-10-16 21:15:10How often should you clean your boat? Auto detailing: Hire a professional or DIY? Do you know the difference between car washing and detailing? Care tips to keep your boat looking great Auto detailing: Hire a professional or DIY?